CoPP | CCIE or Null! BGP like other routing protocols need to be protected. Remember BGP runs off of TCP port 179 and because of this it is susceptible to the typical vulnerabilities of TCP, but we do have a few options that can be configured to provide some addition security. This should go without explanation like other routing protocols, neighbors will be authenticated using an MD5 key, this key must match on a per neighbor basis. Maxas-limit doesn’t initially appear to apply any real security like the MD5 authentication, but the maxas-limit will prevent your BGP router from accepting routes with an AS-Path longer then the maxas-limit. This can help manage resources and prevent also prevent someone from pre-pending and AS-Path 20 AS’s long, which does not scale very well. Sidebar history lesson: this feature came about after Cisco supported 4 octet AS numbers in the BGP packet (RFC 4893) because of a DoS vulnerability which has been fixed, but it still good practice to control the resources on your router. TTL Security allows you to specify the packet TTL to eBGP neighbors, the reason this provides security is because it allows to specify how far away your peer is going to be. 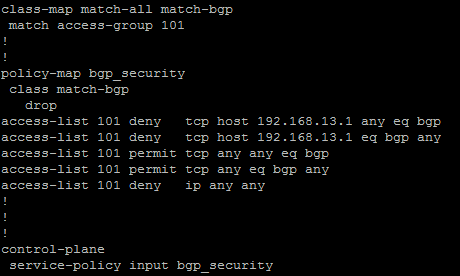 This will make it hard for someone to spoof a BGP neighbor that is further away then the configured TTL. Another option is to configure a service policy applied to the control plane so BGP updates are only processes from specific neighbors and not just anyone. 5. Limit the number prefixes you can learn from a neighbor. This one you have to be careful with because when the prefix limit is reached the neighbor relationship is reset and re-established, obviously this will be production impacting. It can be configured to send a syslog warning message when the maximum prefix limit is reached, however it almost contradicts the purpose of configuring the maximum prefix. Now those are just a few ways you secure BGP in your network you can also filter BGP prefixes through a prefix-list, filter by ASPATH using regular-expressions, as well as using good old fashioned ACL’s. This Cisco page covers those addition BGP security configurations, and covers the ones I mentioned here.